The Most Common Reason for Couples Sleeping Separately Is Snoring. Most people think that snoring is just what some people do. However, sleeping should be a silent activity. If you are not suffering from a cold or congestion, Snoring is not natural. When you are awake or asleep, breathing effortlessly is essential of wellness; however, Snoring indicates that there is a disturbance in normal and healthy breathing. 1 in 3 adults snore on a regular basis and up to 50% snore occasionally. There could be up to 80 million regularly snoring adults in the United States. Snoring can be inherited. Nearly 70% of snorers have a hereditary link. Men snore at a ratio of 2:1 to women. The gap narrows as women get older and reach menopause. Up to 59% of people report that their partner snores in bed. 23% of couples sleep in separate beds. Snorers are 3 times more likely to suffer adverse health condition than non-snorers. Snoring may be more than a nuisance. When you are awake the tissues in the throat and upper airway are open and allow air to flow to the lungs smoothly, but when a person falls asleep the soft tissues relax and can partially block the airway. The sound you hear from a snore is a vibration caused by an obstruction of the airway. The snoring sound comes from the uvula, the back of the tongue or the other soft tissues of the throat flapping as air passes over them when you breathe during sleep. This obstruction causes a decrease of air flow to the lungs, causing a low circulating oxygen in blood leading lack of adequate oxygen to the brain. SLEEPING POSITION: Sleeping on your back can increase the severity of an obstructed airway. ENLARGED TONSILS OR ADENOIDS: Enlarged tissues can contribute to a narrow airway. DEVIATED NASAL SEPTUM: Obstruction in the nasal passage way can cause snoring. MUSCLE RELAXERS OR SLEEPING PILLS: Causes the tissues to relax more than normal increasing the risk of airway blockage. EXCESS WEIGHT: Especially around the neck can increase the risk of airway blockage through excess or enlarged tissues. SMOKING OR DRINKING ALCOHOL: Any sedatives or airway irritants can increase the risk of airway collapsibility. In children, snoring should never be ignored; it may increase the risk of attention deficit / hyperactivity disorder (ADHD) and other behavioral problems. Talk to your child’s healthcare provider right away if you have witnessed your child snore or stop breathing while they sleep. 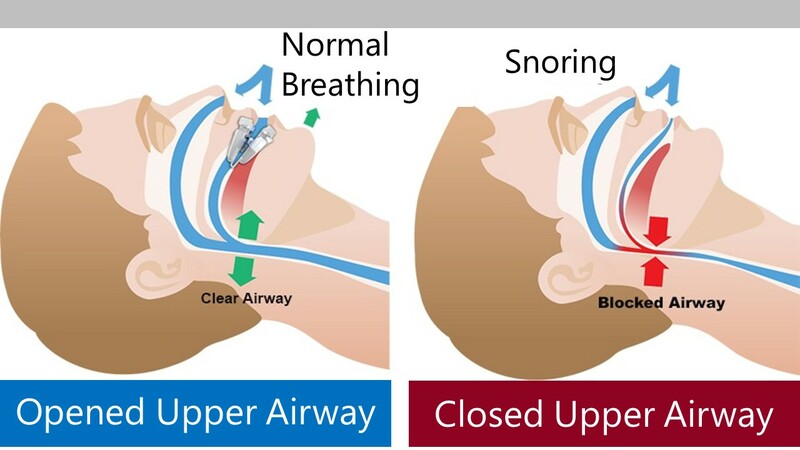 Snoring can be associated with several types of sleep disorders; the most common is Obstructive Sleep Apnea (OSA) and Upper Airway Resistance Syndrome (UARS). All of these have one thing in common – you are not breathing normally while you sleep, and you need to consult a health care provider to receive the help you need to get a better night’s sleep. The concern is that the collapse of the airway causes a decrease of airflow to the lungs, resulting in a lack of oxygen to the brain and other vital organs. Not only does snoring affect your sleep, but untreated snoring can increase your risk of diabetes, high blood pressure, heart failure and stroke. If you or someone you know snores, they should consult a medical professional trained in snoring and sleep disorders as it could be a sign of a more serious medical condition. 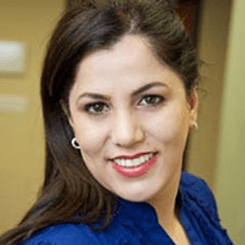 A quick consultation with your Snoring dentist at Aria dental can help determine if it is more than snoring and get you on the path to start feeling better. Just because you snore or have sleep apnea doesn’t mean you have to live with it. There are many treatment options to get rid of snoring or manage OSA. Before initiating any treatment, it is important to rule out any associated sleep disorders that may be the cause of the snoring. Treatment options range from CPAP to convenient, comfortable, and effective oral appliances. 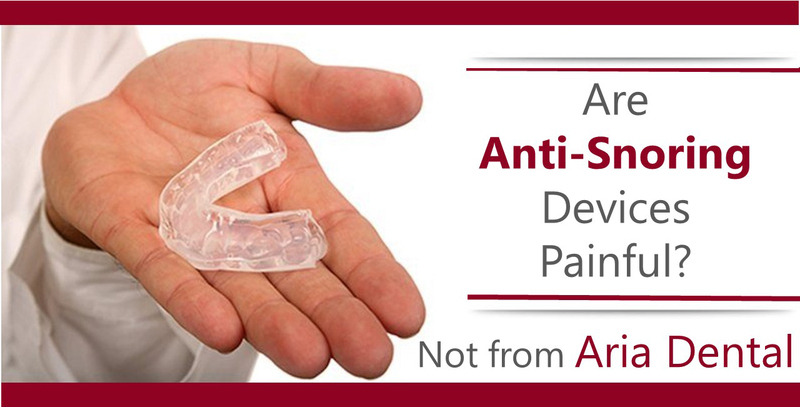 MANDIBULAR ADVANCEMENT SPLINT (MAS): Mandibular advancement splints are by far the most numerous type on the market. They all function to reposition and maintain the lower jaw (mandible) forward in a protruded position during sleep. This serves to open the airway by indirectly pulling the tongue forward. TONGUE RETAINING DEVICE: There are only a few tongue retaining devices available, but they have been well studied and shown to be effective in many patients by means of a suction bulb that hold the tongue. When the tongue is in a forward position, the back of the tongue does not collapse during sleep and obstruct the airway in the throat. To learn more about a mandibular advancement device, call Aria Dental or email us to schedule a consultation appointment. Noise: The CPAP machine is too noisy to allow sleep. Discomfort: Caused by straps and headgear or poor fit. Relationships: The fear of compromised relationship. Restrictions: Inability to move or change positions during sleep. Perceived Effectiveness: Lack of noticeable symptom improvement. Tooth Movement: Pressure on upper lip causing tooth related problems, including shifting in tooth position and tooth pain. Claustrophobia: Feeling of suffocation from the maslk. Air intake: Air trapped in the stomach or sinuses. Intolerance: Patients often report removing the mask during sleep without knowing it or general intolerance of the pressure. Do Most People Sleep Better Alone? Did you know that having a regular bed partner can improve your quality of sleep? Unfortunately this is only the case in the absence of snoring. Anyone who has slept with a person who snores knows it can disrupt his or her sleep. In a poll by the National Sleep Foundation, 41% of respondents rated their partner’s snoring as having a big impact on their ability to get a good night’s sleep in the past two weeks. Up to 59% of people report that their partner snores in bed. 23% of couples sleep in separate beds. Over 1/3 of couple’s report disharmony within the relationship due to snoring. One hour of sleep per night is typically lost from the snorer’s partner; he/she may wake up as many as 21 times per hour. Second-hand snoring can cause the bed-partner to suffer the same daytime sleepiness problems that their snoring partner experiences which may lead to marital disharmony. Bed partners of snorers may wake up several times per hour, which can add up to an hour of sleep lost every night. This effect, known as "Spousal Arousal Syndrome", results in bed partners waking up tired and irritable and leads to deterioration of relationships, depression and other adverse health consequences. Research in 2003 showed that the bed-partners of snorers may experience noise-induced hearing loss over time. The effect of the noise on a sleeping partner of a snorer can also raise blood pressure in direct relation to the intensity of the noise. High blood pressure is a known risk factor for stroke, heart disease, kidney disease and dementia. Many couples resort to sleeping in separate bedrooms and some even have homes designed to accommodate a noisy snorer. This undesirable situation is sometimes referred to as "sleep divorce". Many couples want nothing more than the comfort of sleeping with their mate but are just unable to tolerate the noise and disruption of snoring. Studies show that when the snoring or sleep apnea of one partner is treated, the bed-partner's sleep quality is improved leading to better health. One study showed that when symptoms were treated, their partners’ sleep efficiency increased by 13%. Other studies demonstrate that the partner's mood, daytime alertness, quality of life and personal relationship with the snorer is improved when the snoring is resolved. If your partner’s snoring is keeping you up and putting a strain on your relationship, you are not alone. What Can You Do if Your Bed Partner Snores? Talk to your partner about the potential seriousness of the problem and get him/her to a physician or dentist trained to recognize and treat snoring and sleep apnea problems. Realize, of course, that there may be denial, and perhaps embarrassment on the part of your partner. Before you seek treatment for snoring, it’s important to rule out any sleep breathing disorders such as Obstructive sleep apnea that may be the real cause of the snoring. Usually, it's the bed partner who notices the signs of sleep apnea. Sleep apnea usually interrupts loud snoring with a period of silence followed by a loud gasp. Treating only the symptom of snoring in an individual with sleep apnea can be extremely dangerous. Since it is not always easy to tell just from their snoring patterns, it is important to also review the common symptoms of sleep apnea to check for signs. 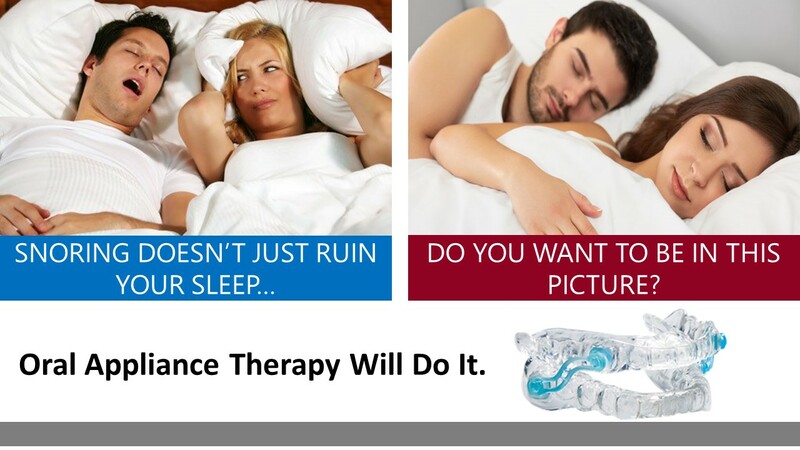 If snoring, sleep apnea, and their related side effects are negatively affecting your relationship with your bed partner, oral appliance therapy has the potential to provide you and your bed partner with the quiet, peaceful sleep necessary to sleep better- together. Get started now with a consultation with your sleep physician or your sleep apnea trained dentist.